How Relevant Is The Information You View Online? Did you know the Internet is changing right now? I recently picked up a book “The Filter Bubble” by Eli Pariser. A few days later, someone forwarded me an interesting Ted video by Eli on the same subject. When you do a search online with Google, it doesn’t provide you with the same information as your next door neighbor would see, your client would see, or a person half way around the world would see. Google now has algorithms in place that filter the relevant information based on your search, where you search from, and your geographical locations, among other things. They use that information to personally tailor your query results, and provide you with the content “they feel” is relevant to you. While in some ways, that can be good, in many more ways that can hurt us all. Your search results may completely ignore current news, news in a different genre, or even news with a different political voice all based on the algorithms in place. Google isn’t the only site doing this. Facebook is also jumping on the bandwagon, and changing your newsfeed based on which friends’ links you click on most. This allows your feed to begin to “ignore” friends in which you have little interaction. Which again means they are controlling what voice and what information you receive on a regular basis. What does this mean to you? First, keep in mind that what you see isn’t what everyone else sees. If you are striving to be number one under a keyword, you may achieve it, but your clients don’t see it because of their search patterns. Next, think congruency. Don’t rely on one site to carry your message – build an online platform that crossed many sites and many interests. 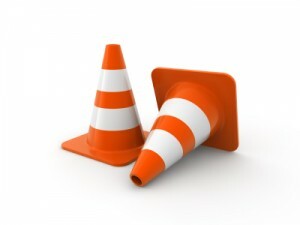 Make sure your message is the same from site to site. Stay active and you will be found. Finally, stay informed. The Internet is still a new venue, and is changing from day to day. The more you learn today, the more you can apply in the future. The important key is to make sure you are reaching out to your customers in many ways, and understand how they like to find you. Don't forget to download your FREE Blogging Planner today. Blogs can benefit any website but don’t worry if you can’t do all the writing yourself … you can hire a ghost blogger for that! Social Marketing – Are You Spending Your Time In The Right Places? The world is a buzz with the networking site Twitter. Yet is that the place where you should spend your time? Just like any other marketing tool, Twitter will only work if that’s where your prospective clients are. 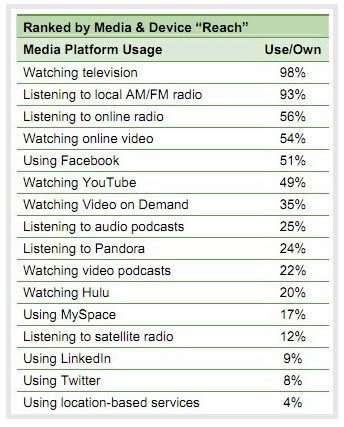 Today I was reading through a new report put out by Edison Research and Arbitron, The Infinite Dial 2011: Navigating Digital Platforms, and noticed some interesting things. Right now, Facebook has reached majority, meaning that more than half of the US population now uses Facebook on a regular basis. In less than 3 years, it has grown from an 8 percent to a 51 percent usage. So if you are trying to reach the average consumer here in America, its pretty safe to say that you can do so through Facebook. One in five Americans report that they have visited social networking sites several times per day. And one in four users state that they are following brands or companies in addition to their online friends. It’s hard to ignore those facts. And it’s hard to run a company, and not know Facebook is the place to be to reach out to target marketplaces. This same report states that while 92 percent of Americans have heard of Twitter, only 8 percent say they have ever used it. One of the biggest reasons I think the gap between those who have heard it and those who have actually used it is so high is because Twitter takes a bit more to understand. When I mention Twitter to a room full of people, I will undoubtedly get the question “Why do people care what I eat for lunch?” The common misnomer about Twitter is you report what you are doing. Twitter is more than that; it’s about communicating, building relationships, and building your expertise. But if your client base doesn’t get it, no matter how much you Tweet, you’ll never reach them. 1. Start by finding out where your clients are. 2. Look towards the future. If statistics show on social platform growing, put your time into that platform. 3. Watch your results. If you see action, keep it up. 4. Try new things. Just because statistics show something is falling off doesn’t mean its not right for you. If you have the time, try it. Then monitor your results, and continue doing what works for you. Are You Protecting Your Wifi Connection? Own a small business? Chances are you are out all the time running errands and meeting clients. And when you stop by your local coffee shop, you probably spend a few minutes checking in online. Have you ever thought about security from that free wifi you get? If not, its time you did. Firesheep is a new free Firefox extension that demonstrates exactly how easy it is to hijack any computer, and shows you how much at risk you can be. After installing Firesheep, you can begin capturing information of everyone using the network with an insecure website connection. So if someone is logging in to their Facebook account, you can simply click on their icon, and you’ll soon be accessing their Facebook account, and have rights to do anything you please within that account. Sound dangerous? You bet. Especially if you have a ton of contacts. The last thing your “friends” want or need is to be spammed by you within your own account. And you also run the risk of having your account terminated if too much damage is done. So how do you protect yourself? Start by securing your web sessions, and secure your computer laptop from anyone at wifi hotspots. 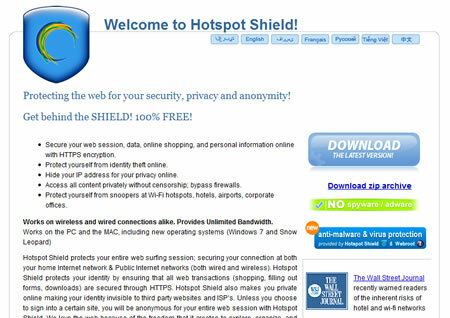 One potential protection software is Hotspot Shield, a free software program that is downloadable, and will protect your IP address and protect you from online identity theft. Know of any other software you recommend? Leave a comment here. Location based platforms are everywhere. With the rise in use in Foursquare, Facebook and Twitter, location based marketing offers promising alternatives for brick and mortar businesses. For those of you that use it, you love it. But if you are still new to the concept, you may be asking yourself “why would anyone want to use this technology?” It opens up a variety of new problems to your already complicated life. GeoLocation sites have their purpose. And as many case studies have show, businesses can do quite well with this technology. But if you decide to use it, you should focus on security first. 1. Never use geolocation features at home. Logging in from home not only tells people when you are at home, it also tells people where your home is. With the huge impact of social over the past few years, if a person wants your home address, nothing can stand in the way of them finding it. But do you really want to broadcast it out to everyone? TheSocialGhost.com shares tips and strategies for using SocialMention to find content for your social media sites and blogs. Is Ghost Blogging A Bad Idea? What SEO Techniques Are Needed To Rank Higher On Google? Are These 5 Things Missing From Your Content Marketing Strategy? "This was an amazing amount of material, great presentation, almost to the point of being overwhelming. I came to simply learn more about blogging and I'm walking away with a lot of ideas on how I can take my idea to a whole different level. Thanks Lori." ~Nancy K.
70% of consumers prefer to learn about a company through articles rather than ads.